"Ma bucur sa fiu un misionara aici in Romania. Iubesc aceasta tara!" 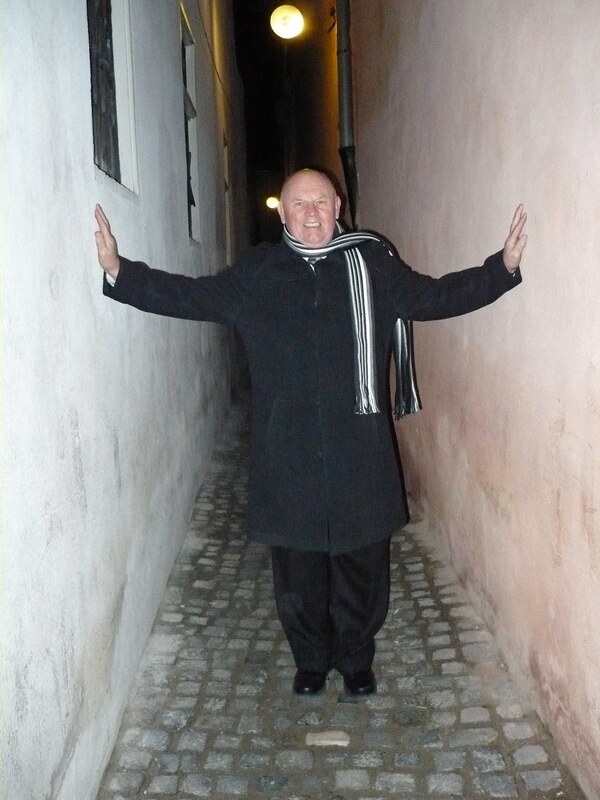 "I'm happy to be a missionary here in Romania. I love this land!" The highlight of this week was preparing and serving a traditional Thanksgiving Dinner to 11 missionaries. As each one entered our apartment, we were paid for all our labor by hearing these words, "Ahhhh. Just like home!" or "My mom...." or "It smells delicious!" or "Homemade rolls!!!!" or "I love Thanksgiving!" or "I'm so hungry!" The meal was not easy to prepare, however as turkeys (for some reason) are not common here. Ours was imported from Brazil! Only the big stores have them and they are tiny (10-12 pounds) and expensive ($25 each). Yams are also rare as is sage and cranberries (non-existant). Just forget about brown sugar for the yams! Somehow we pulled it off! The missionaries are always fun to be around but when they bring flowers and show their best manners, they are especially endearing! As we finished the meal, we each shared an experience or lesson from our mission that we're thankful for. It was a Thanksgiving to remember! Left to Right: Elder Manzione (Utah), Sora Hardy (Utah), Elder Stomberg (Utah), Elder Linerud, Sora Gaughran (England), Sora Linerud, Elder Martineau (Utah), Sora Ostler (Utah), Elder Vekony (Hungary), Sora Gibbons (Virginia). The smiling group as the carnage began. This group devoured 2 turkeys! This was dessert~ pumpkin pie and missionary cheesecake. It doesn't get better than this! I don't recommend the pumpkin pie-making process which included: buying a pumpkin in a neighborhood outdoor piata, baking it, puree-ing it, de-stringing it, traveling across town to pick up a package that arrived in the nick of time from my mom and sister that contained pure gold in the form of ginger and cloves (nowhere to be found here!). The crust is made from butter because Crisco is lost at sea. The process was completed without my Kitchen Aid or a pastry blender! This pie was delicious! Denny had the most important job of the day. With a flashlight, he kept constant watch on the oven temperature, adjusting and re-adjusting to make the most perfect rolls. I made a double batch to allow for sampling! (side note: I will never make rolls again in Romania!) We cooked two turkeys using this process. If you have to have a man in your kitchen, I recommend this job for him! This one talked the whole time, as if we understood every word. As we got ready to go, I packed up our lunch garbage and she asked me for the bag! Evidently, Zip-loc bags are hard to come by! This is the Branch building in Brasov. Brasov is a tourist town with a rich European flavor. This is the main square and in the summer months, it's filled with tourists. The yellow building is the Council House, topped by a Trumpeter's Tower, built in 1420. The last witch burning in Europe happened here! If you come to visit us, we'll take you! This woman finally succeeded in selling us a tablecloth, but not after some serious haggling. If we look cold, it's because we are! Brasov is usually covered in snow by this time. Behind us is the "Black Church". 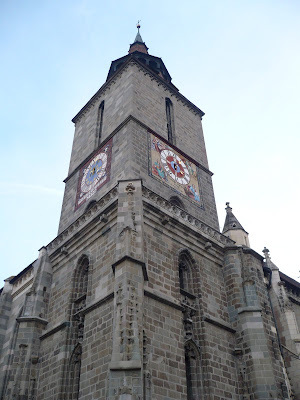 Biserica Neagra is Brasov's main landmark. It is the largest Gothic church between Vienna and Istanbul and still used by German Lutherans today. They give tours and we'll catch one on our next trip. It was built between 1383 and 1480 and its name comes from its appearance after a fire in 1689. A "must see" for every tourist is the smallest street in Europe. We walked it! Call us crazy but the highlight of the trip was eating in this Mexican restaurant! We really miss Mexican food so these Fajitas tasted divine! This picture is for Nancy! The missionaries told us not to miss the donut shop. Mini donuts are piled in a box and then toppings are liberally squirted all over. Lean over when you eat them! Did I say, WE LOVE IT HERE? HAPPY BIRTHDAY, DENNY!! 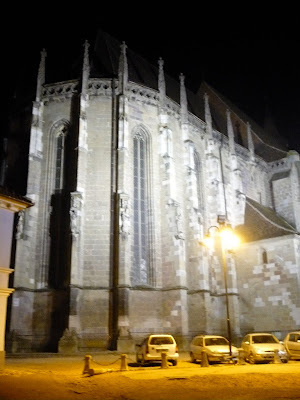 Loved "our" trip through Brasov. You are great tour guides. It's a good thing you get to walk a lot--those goodies look wonderful--including the Mexican dinner. You better start scouting out a place in Bucharest. Color me impressed with that dinner you gave the missionaries--they must have floated home on that good home-style meal. Good job on the rolls, Denny, as I know your job was the most important! Where to this week? Te Iubesc!